Variable song: usually one or more thin whistles followed by wheezy trills on different pitches. Description: Sexes similar. 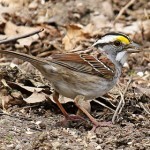 Black-and-white striped crown; pink, orange, or yellowish bill; dull white throat; grayish cheeks. 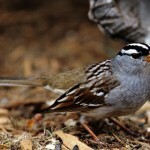 Grayish back with dark streaking; brown rump and wings; grayish underparts with dull whitish belly. Juvenile has brown and buff striped head, with heavy brown streaking on underparts. Habitat: Woodland edges and clearings, thickets, weedy fields, parks, and suburban gardens. Often found along streams. Sometimes comes to feeding stations during winter. Where in Nebraska: Common spring and fall migrant across the state. Locally common winter visitor. 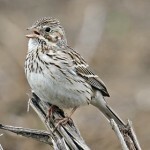 Field Notes: These sparrows often sing all night long. 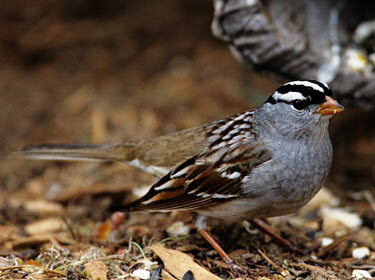 Fun Facts: Male White-crowned Sparrows learn the song they will sing as adults during the first few months of life. However, they don’t learn the song from their fathers but rather neighboring males and can often incorporate more than one males song into their repotoire.